In my May 5th blog entry, I described one way to move your Photoshop Elements Catalog and photos to an external hard drive. In this entry, I’ll cover a related situation. Suppose you have an older version of Photoshop Elements on your Windows XP computer and you just bought a new computer running Vista. Only PSE 5 or PSE 6 will install and run properly under Vista, and for PSE 5 you will have to download a free patch from Adobe. If you have PSE 3 or PSE 4, here is a way for you to copy your catalog and your images to your new Vista PC after you have installed PSE 6 on it. The following are the general steps you can use to convert your Catalog from an earlier version of PSE to PSE 6 installed on a new and different computer. In the older version of PSE, reconnect all missing files by clicking on File > Reconnect > All Missing Files. If some files are missing and you do not know where they are, delete them from the Catalog. Do this only if there are a very few files. If the list is extensive, the pictures are important, and/or you know where they have been moved to, it is far better to Reconnect them before doing the backup in the next step. If there are unconnected/missing files the, converted catalog may have problems. Backing up to CDs or DVDs can also be done. Browse to where you put the full backup you made with the earlier version in the top part of the dialog box. Click on New Location in the lower part of the dialog box. Place a checkmark next to Restore Original Structure. See the figure below. 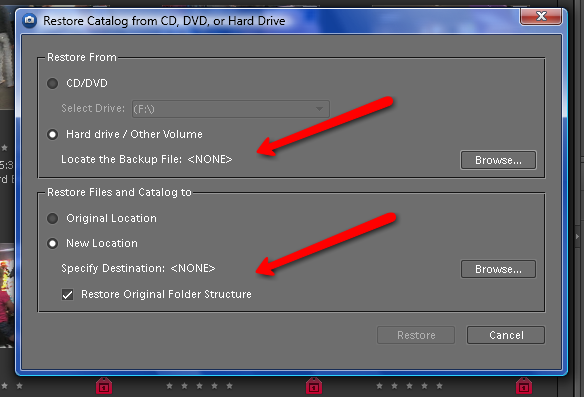 PSE 6 will first restore the backup folder to the structure that was compatible with the older version of PSE. It then converts the catalog to the new structure used by PSE 6. All of your images and tags will be converted and copied to your new PC. Depending upon what earlier version you are upgrading from, some of your creations may be lost. Later versions of PSE have made substantial changes to the various Creation formats. It’s a good idea to quickly check to see that all of your pictures have been properly copied over along with your tag structure and picture assignments.